Fuel filters are considered as one of the most important elements in fuel filtration system, as quality of fuel affects on engine smooth operation and its life. Unfailing operation of fuel filters is critical when there is a possibility of low quality fuel. 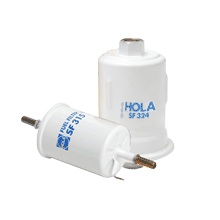 HOLA fuel filters consist of safety body, filtering element and inlet and exhaust pipes. Construction is sealed unit. Body covered by anticorrosion galvanic coating from both sides and painting on face side. Filtering element is made from special paper treated by phenolic resin. During production filters pass multi-layer quality tests including 100% proofness test. Improved corrosion resistance of metallic filters parts.